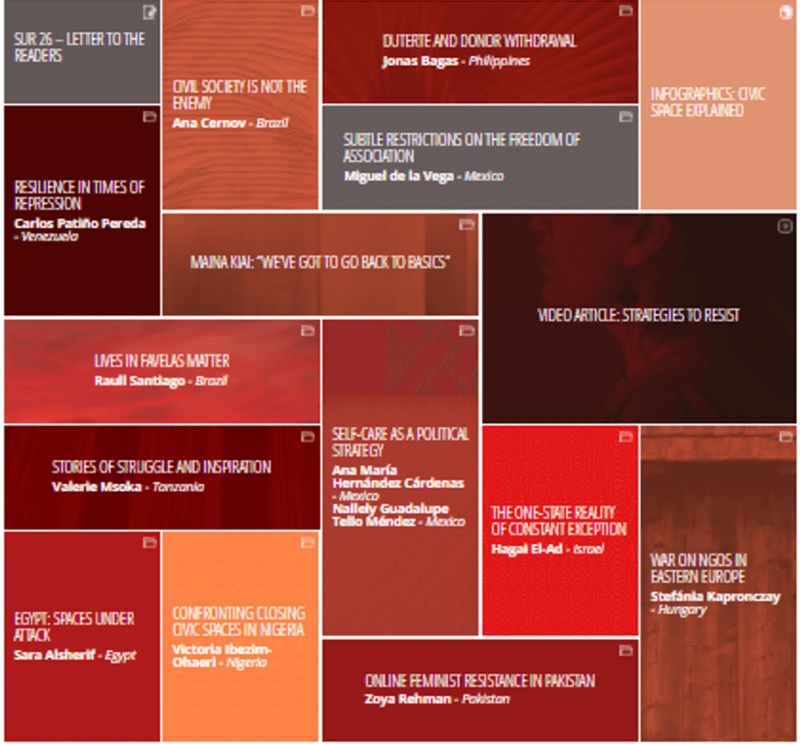 Since beginning to prepare the 26th edition of the Sur International Journal on Human Rights, which Conectas is grateful to have collaborated on with the Fund for Global Human Rights (The Fund), we have witnessed continued crackdowns on civil society around the world. As shown by both the geographic reach of the contributions (authors from 16 countries) and the infographics to this edition, the issue is clearly of global concern. The first section of the journal seeks to address why this crackdown is happening, who is driving it and whether there is cross-fertilisation of ideas between actors. The edition then focuses on the strategies that activists are implementing to combat the crackdown. A summary of these strategies can be seen in a video which captures a number of the author activists’ perspectives, shared when they gathered in São Paulo in October 2017 for a writers’ retreat. In deciding to produce this special edition of Sur, Conectas and The Fund aimed to address the imbalance in material currently available, the majority of which focuses on the diagnostics, rather than the responses to the crackdowns that we are witnessing. The contributions to this edition provide a wealth of strategies that the activist authors are implementing in their local contexts, which might be adapted and replicated in other countries or regions. The authors offer a self-critical examination, helping readers to understand what strategies are successful but also where the challenges lie in each. This edition also includes contributions that address the financial resilience, sustainability and well-being of human rights organisations in the context of the restrictions on cross-border philanthropy and the insecurity and fear created by the current wave of repression being seen across the globe. Despite the difficult scenarios in which many of the authors featured in this edition operate, the overwhelming message is not of a hopeless battle against ever powerful forces. Instead, the activists in this edition describe a vibrant civil society that is adapting to the current challenges with creativity, resilience and hope. Furthermore, the contributions stress the importance and effectiveness of coordination and alliances between civil society movements, moving beyond the narrow silos we often occupy. When this creativity, resilience and hope come together with a renewed sense of community and common purpose, cutting across traditional lines, we begin to see a force that can resist the crackdown and reclaim civic space. In helping to understand why we are witnessing this crackdown, Ana Cernov, Victoria Ohaeri, Olga Guzman and Zoya Rehman refer to the negative perception of rights activists in many contexts and the questions surrounding the legitimacy and accountability of NGOs – often fostered by repressive authorities to facilitate their attempts to restrict civil society and which blunts civil society’s ability to fight back as it then lacks wider public support. Maina Kiai, Danny Sriskandarajah and Mandeep Tiwana and Denise Dora, Ravindran Daniel and Barbara Klugman highlight the role of the private sector and its convergence of interests – even outright collusion – with repressive governments as being another important driver in the crackdown. With the majority of companies focussed on maximising profits, these authors question whether the sector can truly be seen as an ally in promoting and protecting human rights. Multiple contributions point to the Global North whose role in causing the crackdown has not been examined sufficiently. Ana Cernov, Maina Kiai, Danny Sriskandarajah and Mandeep Tiwana all conclude that the increasingly populist and nationalistic tendencies that the Global North is witnessing is emboldening repressive governments to more brazenly justify restrictions from the viewpoint of “if they can get away with that, then so can we” (Maina Kiai). In addition, these tendencies also result in less money flowing to the Global South to support critical work that protects and enables civil society – either because aid budgets are dwindling or because populations are becoming more selective in their personal donations (Ana Cernov). The North’s role must not be forgotten in relation to the Financial Action Task Force (discussed by Ana Cernov, Victoria Ohaeri and Miguel de la Vega) – being founded after all by a group of northern countries, the G7, in 1989 – whose legitimate aim to counter terrorist financing and prevent money-laundering has unwittingly strengthened the hand of repressive states. Crucially, underpinning all this is the fact that the global crackdown is a “gendered phenomenon” (Bondita Acharya, Helen Kezie-Nwoha, Sondos Shabayek, Shalini Eddens and Susan Jessop). Not only do women and the LGBTI community experience repression because of the gendered nature of their work, but in countries where civil society is particularly under attack, traditional gender roles and patriarchal values are used as a further means of repression, compounded by other forms of discrimination based on sexual orientation, class and race. The importance of coalition and alliance building was referenced most often by the authors as a key strategy in resisting restrictions against civil society (Ana Cernov, Stefánia Kapronczay, Adrian Jjuuko and Linette du Toit, Danny Sriskandarajah and Mandeep Tiwana, Miguel de la Vega, Olga Guzman, Raull Santiago, Zoya Rehman, Jonas Bagas, Valerie Msoka and Denise Dora, Ravindran Daniel and Barbara Klugman). Authors describe how coalition and alliance building helps breakdown the traditional silos in which human rights organisations often operate. Working in coalitions and alliances provides a stronger collective voice and action that can contribute to knowledge sharing and capacity building around strategies and tactics for compliance and pushback. In addition, this strategy reduces the likelihood, or impact, of one organisation being targeted by authorities. That said, the process is not without its challenges. Deciding on what the common goals are and ensuring all organisations have an equal voice – regardless of size and resources – can be difficult at the best of times, and is even more so in a context of sustained repression where the stakes are higher. And at times the views of members can differ resulting in fractions or even collapse of the alliance. Protest also remains an important strategy, with Maina Kiai describing it as what is “most effective” to highlight the excessive use of state power against civil society. Sara Alsherif describes how No Military Trials for Civilians has used protest as a strategy to campaign against military trials for civilians in Egypt. She examines the dangers that protest can bring to life and limb – particularly pronounced in countries that have repressive governments – and the importance of evaluating the strategy against these threats. Consequently, the group has adapted how and when they use protest as a result of the authorities’ increasing brutality towards protestors. Victoria Ohaeri and Miguel de la Vega describe how their respective organisations consider monitoring, understanding and recording restrictive measures as the first step in effective resistance to the closing of civic spaces. It is critical to be aware of every law that is being discussed by parliament, given that attempts to restrict civil society can be hidden in the most innocuous sounding bills. In addition, by building this expertise, the organisations become a reference on the subject thus strengthening their advocacy on the matter both nationally and internationally within the media and parliamentary hearings on draft legislation. Denise Dora, Ravindran Daniel and Barbara Klugman also highlight knowledge production as an important tool – particularly from a Global South perspective – as this helps inform the global understanding of the forces at work locally and guide the responses of international NGOs and donors. Despite the significant challenges and restrictions that many authorities are placing on civil society, Miguel de la Vega, Sara Alsherif and Jonas Bagas report that it is never the less important, in certain contexts, to maintain dialogue with government and find more understanding points of view or even allies within what otherwise may appear to be a very closed political system. Such individuals can prove a useful foot in the door in order to begin dialogue, deliver proposals or even find alternative means of funding. Where political allies are not possible, the justice system remains an important tool, with many successes, as noted by Victoria Ohaeri, Adrian Jjuuko and Linette du Toit. As well as bringing cases to national courts, the importance of operating at a regional level was also emphasised by Denise Dora, Ravindran Daniel and Barbara Klugman and Adrian Jjuuko and Linette du Toit. Such action helps dispel the narrative that the values of civil society are derived from the Global North – a strategy often employed by repressive governments to discredit the work of NGOs. The role of new media and online spaces in combatting the crackdown is prevalent in the contributions. The ease and speed with which information can be passed on platforms such as Facebook, Twitter, WhatsApp and Telegram was cited as being important in mobilising support rapidly as well as helping reach previously untapped constituents (Sara Alsherif, Zoya Rehman, Raull Santiago, Victoria Ohaeri, Valerie Msoka and Denise Dora, Ravindran Daniel and Barbara Klugman). Despite the opportunities, Bondita Acharya, Helen Kezie-Nwoha, Sondos Shabayek, Shalini Eddens and Susan Jessop, Sara Alsherif and Zoya Rehman all note the challenges that digital tools present. Harassment of activists online is becoming increasingly common, particularly towards women. In addition, authorities are constantly developing new ways of monitoring these platforms. To combat this, Sara Alsherif describes how developing relationships with tech companies can help activists stay one step ahead of the curve. The use of video is explored by Hagai El-Ad and Raull Santiago, both of whom describe how the medium is an important tool in capturing the restrictions being inflicted on civil society in their respective contexts. Moreover, Raull Santiago describes how his collective is trying to use these video images, captured by members of his community, in legal processes against the police force. Carlos Patiño discusses the importance of developing and maintaining resilience amongst activists. Self-care is just one method that he discusses and which is explored in more detail by Adrian Jjuuko and Linette du Toit and Ana Hernández and Nallely Tello. Both articles emphasise that the self-care of activists must play a central role in sustaining the movement – and both individuals and organisations share a responsibility in guaranteeing this well-being. The role of donors in ensuring that funds are available for this kind of self-care is also discussed by Bondita Acharya, Helen Kezie-Nwoha, Sondos Shabayek, Shalini Eddens and Susan Jessop. Danny Sriskandarajah and Mandeep Tiwana, Maina Kiai and Bondita Acharya, Helen Kezie-Nwoha, Sondos Shabayek, Shalini Eddens and Susan Jessop all emphasise that donors must focus more on funding grassroots organisations and provide more flexible means of funding to enable quick response actions from organisations who are otherwise constrained by project funding. Burdensome reporting requirements and funding calls, which create competition amongst organisations, are also highlighted as areas that funders need to improve their policies on to allow activists to act with agility and focus not only on their mission but the defence of their space to operate at all. Jonas Bagas offers a critical perspective on the way in which funders withdraw from certain countries and regions, the effects of which are exacerbated in the context of shrinking civic space. He suggests how the process can best be managed by both the funder and civil society to better guarantee the sustainability of the organisations involved. Inevitably this requires adaptability on the part of civil society. The question of adaptability in the context of restrictions on civil society is also addressed by Shannon Green. She presents alternative organisational and financing models that might help activists circumvent crackdowns aimed at NGOs. G. Ananthapadmanabhan and Shambhavi Madhan note that activists must also adapt their language and the way in which they communicate with funders in order to narrow the gap between human rights and development funding. Conectas would like to emphasise that this issue of Sur Journal was made possible with the support of the Channel Foundation, the Ford Foundation, Open Society Foundations, the Oak Foundation, the Sigrid Rausing Trust, the International Development Research Centre (IDRC) and the Swedish International Development Cooperation Agency (SIDA), as well as some anonymous donors. Special thanks for this 26th edition go to the Fund for Global Human Rights, especially to James Savage whose willingness to share his understanding of civic space issues with the authors and the editorial staff has contributed enormously to the edition. We are also extremely thankful to the following people for assisting with this issue: Alexandra DeBlock, Adriana Guimarães, Bianca Santana, Celina Lagrutta, Daniella Hiche, Evandro Lisboa Freire, Fernando Campos Leza, Fernando Sciré, Gustavo Huppes, Gustavo Valentim, Isis Lima Soares, Joana Amaral, Karen Lang, Luiza Bodenmuller, Mariana Manfredi, Muriel Asseraf, Nilda Bullain, Pedro Maia Soares, Renato Barreto, Sebastián Porrua Schiess and Thiago Amparo. Additionally, we are especially grateful for the collaboration of the authors and the hard work of the Journal’s editorial team and executive board. The communication teams from Conectas and The Fund for Global Human Rights deserve great credit for their dedication to this issue.